No doubt all of you are familiar with the iconic 1963 The Ventures model, as well as the Joe Maphis model that preceded it. This little known chapter in the evolution of the classic Mosrite electric guitar, however, may be new to you. According to legend Semie Moseley prototyped a couple of these blacked-out Joe Maphis singlenecks for Bob Crooks' Standel amplifier company. This particular one was discovered in a California pawn shop by Steve Soest, if memory serves. dorkrockrecords wrote: No doubt all of you are familiar with the iconic 1963 The Ventures model, as well as the Joe Maphis model that preceded it. This little known chapter in the evolution of the classic Mosrite electric guitar, however, may be new to you. According to legend Semie Moseley prototyped a couple of these blacked-out Joe Maphis singlenecks for Bob Crooks' Standel amplifier company. This particular one was discovered in a California pawn shop by Steve Soest, if memory serves. I love this type of history! 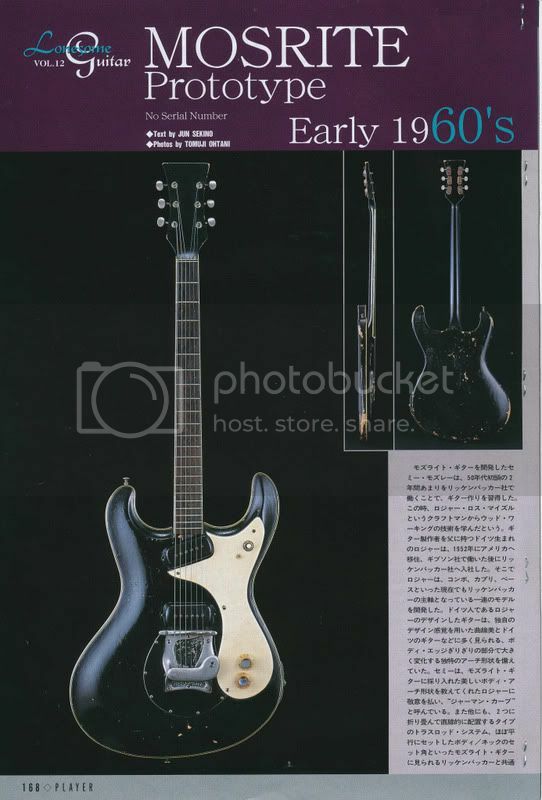 The Mosrite Joe Maphis I owned in the '80s was found in a San Fernando Valley (Van Nuys) pawn shop, $200 or less! Here in NYC I'm always hoping I walk in the local thrifts and I spy a Mosrite whatever! I've seen many people walk in to donate and they are carrying guitar cases but the contents are usually the lower models even if they are Fenders or Gibsons. The Housing Works chain of thrift stores has the lowest prices for quality, name brand items but they also have an auction website and I'm sure they're aware of certain items that'll bring in the big bucks. Someone will recognize a Mosrite guitar or bass and if it's a The Ventures model it's gonna wind up in an auction. Usually, though, my local branch features auction items in the window so I could spot something worth considering. Thanks for posting this as one never knows what one will discover somewhere. Oh, my goodness...like finding an unknown Rembrandt on a Fleamarket! These are great historical footnotes that feed the mystique of Mosrite. This is one of my favorite looking guitars of all time, period. Wow, this is really amazing. What does the text say? Any chance you can give us a translation? 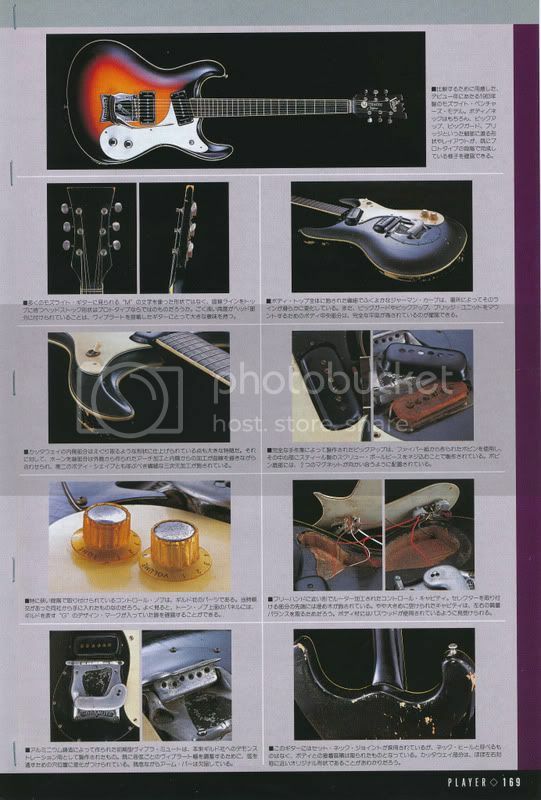 Also, it looks like the neck is actually angled towards the body - I was under the impression that the early mistake plate guitars had been built with a neck parallel to the body and that's what made the embedded vibrato necessary. This however goes even beyond that! Also, it looks like there's not much less pronounced volute than on the eventual Ventures version. Most interesting observations Mel, as it deals with such a significant phase in the development of Semie's offset model electric guitar. I do not think that it is due to heavy strings that might be tugging at the neck and pulling it towards the body...I don't see any bow/relief in the neck, right? Very sharp, you are truly amazing. Fascinating bit of history, and one of the last great electric guitar designs. my guess is it was semie trying out different neck angles until he found what made him happy with the design. 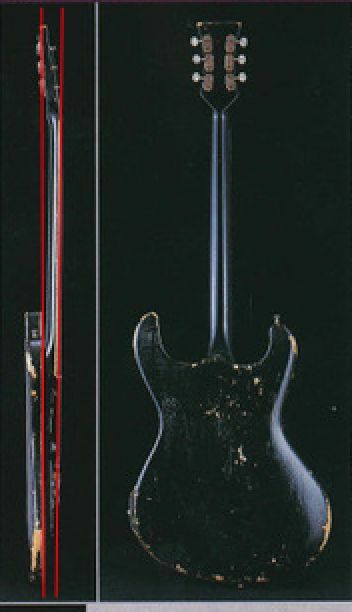 the les paul model went through a similar transformation in the early years as well.